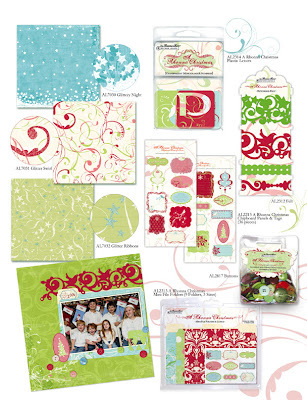 I've been a great fan on Rhonna Farrer's (of Autumn Leaves) products for awhile now and her new Rhonna Christmas line certainly doesn't disappoint. She's always impressed me with her bold use of color. Her intricate die cut designs in some of the papers themselves and also in the embellishments are just awe-inspiring. I also envy her delicate doodling (certainly can't do this myself!). 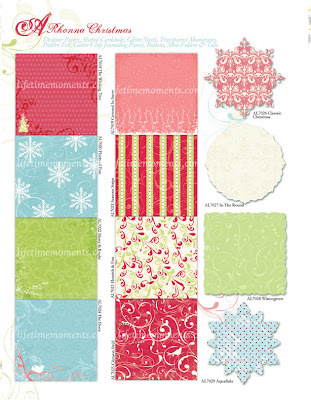 As if they weren't beautiful enough, this line also includes a few papers with glitter accenting...just another way to enhance the feeling of 'magic' on holiday layouts. I also love the patterned felt that can act as ribbon and or borders and the texture and sense of 'warmth' it will add to the season. Now I can't wait for Christmas and winter/snow (well, maybe not the second part) to get here again so I can use this line!! Rhonna...I just can't say enough...you are amazing!